Origins, space and time; the life of a sculptor. David Nash has a real fascination with wood. He knows his material intimately. He knows how it weathers, dries out, splits aling the grain. He understands how it chars and how it becomes waterlogged and rots. Wood expresses the fundamental elements of life; earth, fire, air and water. Nash is interested in how wood comes into being, how it occupies a place and how it changes. It might be a commentary on the human lifespan. Some of his creations take years for Nash to complete. He planted Ash Dome, a ring of ash trees in 1977 and then fletched the joints so that as they grew, they appeared to be dancing in sequence and then bending in on each other to form the shape of a dome. . 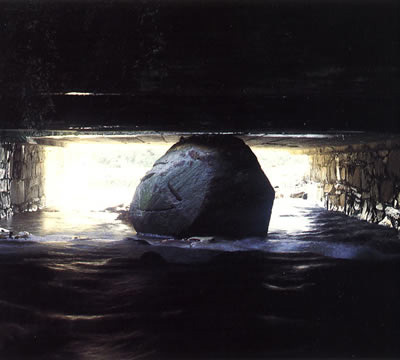 He launched his wooden boulder in a stream in 1979 and followed its progress, urged on by storms and floods until it reached a bigger river and finally the estuary. He then plotted its progress with the tide up and down the estuary until it finally disappeared. Now after three years, it has turned up again in the same estuary. In Bretton Park, he has charred a tree trunk and bole by building a palisade of sticks around them and setting them alight with a burner. The surface of the trunk splits and cracks into shiny charcoal nodules. He has embedded 28 charred oak steps up the Oxley Bank in 30 tons of Barnsley coal. They will slowly be worn down by people walking on them and return to the earth. Nash likes to study how things decay. He bought his chapel studio in Blanau Ffestiniog in 1967. Hunkered down n a wasteland of slate, filled with half completed works, one gets the impression that he is waiting for growth and time to transform them and him. Occasionally Nash’s his work is more political. 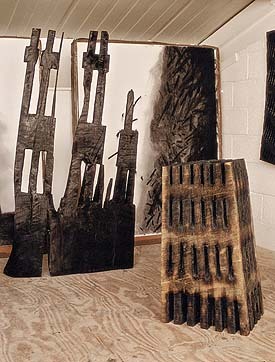 The charred verticals and cross pieces of ‘An awful falling’ evoke the destruction of The World Trade Centre, while ‘Husk’ a group of hollowed out, charred, rectangular blocks of oak, resemble a burnt out village in Palestine. I love the scale of Nash’s work. Who would wait 30 years for nature to complete a work? Who would shape a gigantic piece Californian redwood shaped into a square with a gigantic two man chain saw and install it with off-cuts in an underground gallery in Yorkshire? Who would arrange three massive tree trunks on the lawn, curious to see the way the wood would split. But at the other end of the scale is elegant Ubus, two slender limbs of wood, one oak, one beech, leaning into each other to resemble an arch, reminiscent of the whalebone arch in Cley-next-the-sea. This is my second visit to Nash’s epic retrospective at the Yorkshire Sculpture Park. Simon gave me his ticket to the opening and I met the artist. He had the look of an explorer about him, a trained observer, more scientist than artist; clear, perceptive, curious, calculating and full of insight and possibility. I marvelled again at the confidence and self belief of the artist and guessed that it came from a fascination with the object and not with himself as the artist. He piercing blue eyes put me in context as they would a block of wood. David Nash’s exhibition will be at the Yorkshire Sculpture Park until February, changing with time and the seasons. It’s not far away; I shall evolve with it. I thought it was going to be too clever by half, a criticism so often levelled at Stoppard and parodied in the character of Henry, the playwright. Was his writing the real thing or just or just the defensive manipulations of an expert wordsmith, obfuscating, confusing, keeping everything ambivalent? Henry compares the writer to a sprung cricket bat. Words fly of the bat and can go for miles. They deserve respect, but is that the real thing or just the craft of make believe? Henry eloquently compares being in love to colonisation, I write just for you. I write just to be worth your love. It has taken him over, subsumed all of the meaning in his life. He lives with Annie in their own bubble of happiness. ‘Love is knowing and being known’ So is being in love an enhanced image of self, air brushed and in soft focus. Aren’t lovers really in love with themselves, as seen through the gaze of the other? ‘When it’s there, you are happy and nice to know, but when its gone, you count for nothing and all you have is pain. So Henry is dependant, even though he fights it. They both are. They have given each other power over their lives, the power to destroy each other. Anything you think is right; what you want is right. This is the extent of the dependency. But human relationships cannot be so confined as Annie explains when she admits her infidelity – ‘this is not a commitment, just a bargain’ – a deal and it gets complicated when you have an affair and enter into a deal with two people. As Annie says, ‘I have to chose whom I hurt more’ You are stronger, you can take it. Maybe being in love becomes a performance, an obligation that you have to act out, because the threat of loss is so great. It’s better to destroy the hope than to live a love that gives false joy. 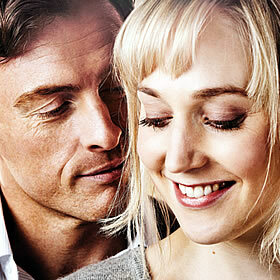 The Real Thing was written in 1985 and has been playing at The Old Vic with Toby Stephens and Hannah Morahan as Henry and Annie. Stoppard tackles an intense and important topic with consummate insight, wit and style. More war than peace at the last station. Lev Nikolayevich Tolstoy has undergone a change. He has come to believe that lasting happiness can only be attained by striving for inner self-perfection through renunciation, non violent resistance, altruism and denial of the ego. In a statement that presages the revolution, Tolstoy concludes that the aristocracy are a burden on the poor, and we must live together in a state of anarchy. So he has eschewed the life of a Count, adopted the dress and behaviour of a simple Russian peasant and lives in an agrarian commune, where he and his acolytes and disciples adopt an ascetic, vegetarian, self sacrificing life style. He opposes private property and has been giving away his wealth to his serfs. He has even challenged the institution of marriage and espouses notions of chastity and sexual abstinence. No wonder his wife of nearly 50 years, Sofya Andreevna, is alarmed. She does not welcome her husband’s asceticism and self sacrifice; it demands too much self sacrifice from her. Hadn’t she borne him 13 children and painstakingly ploughed through the proofs of all his novels? Wasn’t she entitled to enjoy the sophistication and attention her position had brought her? And now her husband is plotting with his entourage to make a secret revision to leave the copyright of his work to the Russian people! She is furious! So it’s war and not much peace in the Tolstoy house, as various factions battle for the author’s attention and favour. Theirs’ has been a marriage of great passion, albeit requiring much understanding from Sofya. On the eve of their marriage, Lev presented his young wife with his diaries, which chronicled his sexual adventures. But now he is tired. He just desires peace and craves the life of a wandering ascetic while Sofya, much younger than her husband, still needs to feel adored and desired. In her sixties, Sofia still has the energy to be wilful, charming and seductive. And if this doesn’t provide her with the attention she felt was her due, then she will sulk, act out and is quite prepared to destroy Tolstoy’s purpose and mission. This is what the disciples are afraid of. They have invested too much in the Tolstoy brand to risk the Countess’s ire. Vladimir Chertkov regards himself as the guardian of the great man’s reputation and wants the money from War and Peace to be used to advance the cause of universal love and passive resistance. It is 1910 and the rumblings of the revolution can be heard in the distance. It is not that Sophia is bad; a hundred years later we can all too clearly understand her indignation. But she is dangerous; impulsive, histrionic, dramatic, suspicious – the epitome of what has come to be regarded in psychoanalytic terminology as the borderline hysteric. Attention and love is her life blood and if she doesn’t get it, she will cause trouble. 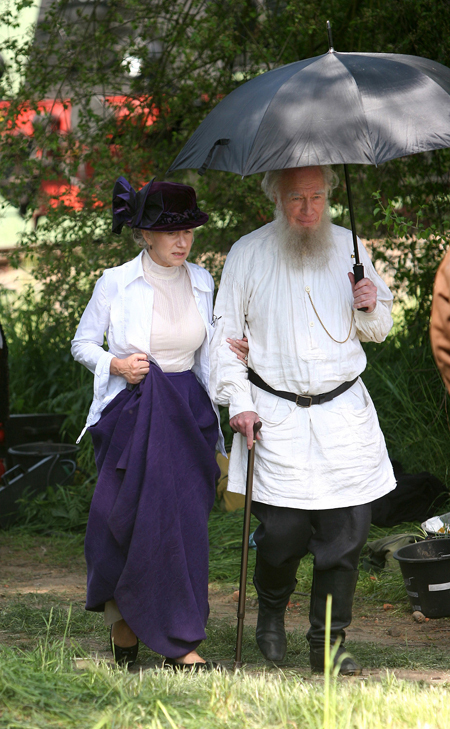 Tolstoy’s entourage are accustomed to her histrionics and don’t take too much notice of them. Their mission is protect the great man from her, to allow him the peace he needs to think and work and to record the last of his life for posterity. So Sofya is conveniently regarded as mad, but the situation is such to bring out the worst in her. Things come to a head late in 1910. Not in the most robust health and tired of Sofya’s histrionics, Tolstoy gathers up the courage to abandon his family and wealth and heads south. True to form, Sofia reacts with a hysterical fit, tumbling off the landing stage into the lake. When Lev Nikolayevich leans of it, he just rolls his eyes. But he does love his wife. They had shared a passion, allowed to few and still have the understanding that prolonged love and companionship bring. It is just that her suspicion, impulsiveness and neediness make her very difficult to live with. Lev had been speaking and writing of his own death in the days preceding his departure. So it was half expected and feared that he would fall ill. Within three days he has a high fever and succumbs to pneumonia at the remote station at Astropovo. Sofya is prevented from talking to her husband. As a counterpoint for the dwindling love between Tolstoy and his wife is the burgeoning passion between Valentin, Tolstoy’s new secretary and the feisty Masha, who seduces the celibate Valentin. In a way, the couples are similar; the menn ascetic and high principled, the woman passionate, inspirational and dangerous. Although Christian ethics tended to blame women for distracting such men from the path of true devotion, surely Sofya and others who devote themselves to great men (Gandhi’s wife for example), have a right to feel betrayed by their husbands devotion to the self and the divine.